It’s homecoming at Samford University! While students have spent the week electing campus royalty, decorating displays and enjoying other traditions, the arrival of alumni for events on Friday, Oct. 31, underscored the special reunion aspect of homecoming. 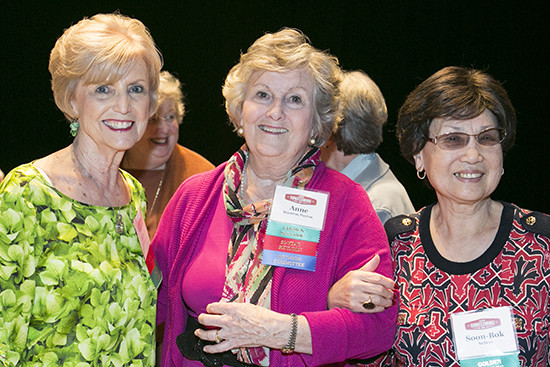 Samford graduates of classes from 1964 and earlier, known as Golden Bulldogs, reminisced at a luncheon in Wright Center. Alumni who have studied at Samford’s London Study Centre during its 30-year existence met to reflect on their shared experiences over afternoon tea at the President’s home. “If the Samford family is a body, then you are the backbone of that body,” Samford gift and estate planning director Stan Davis told the Golden Bulldogs and guests. Samford president Andrew Westmoreland thanked them for their longtime loyalty and support before giving a brief update on the latest campus developments. The customary David Lockmiller awards were given to the male and female graduates present from the earliest class. This year’s winners were Joe Goode, Class of 1952, and Anne Fadely Anderson, Class of 1953. Each received a handsome engraved clock with a photo showing the campus in its autumn glory. Anderson, of Roebuck Springs, Alabama, was a pharmacy major who met her husband, Roy Anderson, Class of 1951, in a pharmacognosy class. She combined work in pharmacy with life as a wife and mother. Their daughter, Rachel Anderson Harden, is a 1976 Samford pharmacy graduate. Goode recently moved to Clanton, Alabama, after many years in Hendersonville, Tennessee, where he used his business degree to pursue a career financial and estate planning. Goode has long served as a class agent to keep other 1952 graduates engaged with Samford. More than 200 former students and faculty members enjoyed a Daniel House reunion tea hosted by president Westmoreland and his wife Jeanna. Some had studied at the London residential study center soon after Samford acquired the property in the early 1980s. Alan Thrasher, a 1986 business graduate, was in the first wave of Samford students to study there, and still appreciates his experiences during Jan Term in 1985. “I was in the first group of Samford students to tour Lloyd’s of London, the Bank of London and other major companies as part of an international business course,” Thrasher said, admitting that highlights for him also included celebrating New Year’s Eve in Trafalgar Square and turning 22 a week later. Things have a way of coming full circle, the Birmingham entrepreneur said, noting that business took him back to London for the Olympics in 2012. For Kendra Buckles Watson, Class of 2006, the Daniel House also carries a lot of happy memories. “The friendships I made, and being able to learn and see new things became a defining part of my Samford experience,” said Watson, adding that she chose to attend Samford, in part, after learning about the overseas opportunity on a Preview Day visit. Mel Coleman, a 1989 graduate who is now a biology professor at Claremont McKenna College in California, wanted to recapture Daniel House memories before attending her 25th class reunion activities. Based on her London experience, she said she urges her students to consider study abroad. “I tell them it’s a great opportunity, and I encourage them to experience it,” Coleman said. The alumni especially enjoyed reuniting with many Samford faculty members, some now retired, who have served as professors in residence in London through the years. The chatter fell silent when retired music professor Timothy Banks led four current A Cappella Choir singers in a performance of “Ashburn Gardens,” a tune he first composed at the piano in the Daniel House parlor in 1999. Last June, he explained, in anticipation of the 30th anniversary of the Daniel House, he set it as an anthem and added text by the Anglican minister and hymn writer, Timothy Dudley-Smith. “Sometimes tunes just come naturally, and so it was for this one, influenced by the great English hymn-tune writers,” said Banks, who served four stints as professor in residence at the Daniel House and whose two daughters studied there. The musical tribute, he said, is his way of expressing gratitude for what the London Program has done for him and many others over the years. Homecoming events will continue on Friday evening with an alumni banquet and bonfire and pep rally. A full day of events will follow on Saturday.